In my work as an instructional coach at BetterLesson, I support teachers from New York to Montreal to Egypt to make shifts in their practice and try new things. The teachers begin their journey toward a more student-centered classroom at different starting points. Teachers often ask me what other teachers are working on. When a teacher is hesitant to try something new, I often think: What if they were able to learn from a teacher who has already tried it? This is where Darcy comes in. Darcy Mueller is a middle school English teacher in Homer, Alaska. Darcy and I have been working together for two years, and while we have not met in person yet, we have been together every step of the way since Darcy decided she wanted to make a change in her classroom. Here’s a little backstory to set the scene. When we started to work together last year, Darcy was feeling burnt out and lackluster about teaching. I remember in one of our first meetings she described how exhausted she was from trying to keep the kids’ attention and teach her lessons. She started questioning whether teaching was still a good fit for her, much like Hamlet started to question his existence. The one-size-fits-all approach via a whole group lesson wasn’t working for her. It was important to me to support Darcy to experiment with different instructional models that would shift her approach from the sage-on-the-stage to a facilitator of student-centered learning. In order to make such a shift, I have learned through my coaching that a teacher must be willing. As long as the teacher is open to trying to new things, our work can result in powerful shifts that empower teachers and support their students to make progress. Darcy had some prior knowledge and experience with blended and personalized learning, but she hadn’t put all the pieces together. We decided that student choice and differentiation were the priorities. Because Darcy was so willing to experiment, we were able to design systems, try them, reflect, and build and modify as needed. If you are a teacher or an administrator who is questioning your current systems and hesitant to make a change, my hope is that Darcy’s insight and advice will inspire you. Rather than share our victories, Darcy and I wanted to pull back the curtain on blended and personalized learning. We wanted to surface the challenges that came up when she began to use choice boards and how we worked together to address those challenges in our bi-monthly meetings. Julie: Darcy, when we first began our work together, what did you want to try in your classroom? Darcy: In my language arts class, I typically spend a lot of time teaching the critical thinking process. I decided to have a themed unit for my students to work through. My goal was to mix online and offline activities, as I did not have one-to-one technology for students. I wanted to run a choice board three days a week. Students would complete all assignments on the board, thus the choice would be in the order they completed the assignments. Students were given a blank calendar schedule along with the choice board. The calendar had "knowns" already on it, such as Wednesdays were the online discussion days because that was when I could get my classes into a computer lab. These items were glued into their composition notebooks and would be students' guides. Julie: Once you started to use the choice boards, how did this model benefit you and your students? Darcy: Choice boards teach more skills than direct instruction. Some of those skills like time management and attention to detail are the skills that students need to take more ownership over their learning and become more independent in the classroom. With a choice board model, students can move at their own pace and make choices that bring self-awareness to how they learn best and how they prefer to learn. As a teacher, I have more opportunity for one-on-one time with my students. I can pull students for conferences or small group work. I am able to observe my students more and use those observations to inform my instruction. Julie: That sounds incredible! Students have choice. Students have autonomy. Teachers can differentiate. Teachers can observe and assess. We both know that the process of starting choice boards is messy. What are some of the challenges of this model? Darcy: It is hard for students to start this process. Many students aren’t used to making choices. Their teachers tell them what to do and they either do it or they don’t. It takes time to support students to learn how to use the choice board, and for the teacher to develop systems to support students to be successful. Some students have a hard time following multi-step directions and Task Cards help develop that skill. 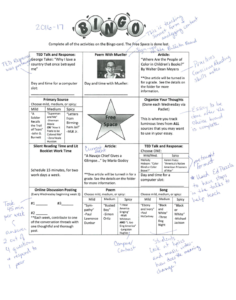 I developed Task Cards for the choices on the board in order to help my students understand what the expectations were step by step; sometimes I created videos for them to refer back to when I was working with small groups. Over the course of using choice boards, I developed a format for the Task Cards, so students would know what to expect. Julie: You have been using this instructional model for almost two years now, and you’ve learned so much about how to make it more effective through experimentation and student feedback. What are some of your tips for teachers who are just getting started? 1. Start Small: Start with a one-day assignment with the direction steps written out; students work through the assignment at their own pace. Build to a week-long choice board. 2. Survey Students and Iterate Based On Their Feedback: Create surveys to check in with students on their comfort level and progress. 3. Develop a Tracking System: This allows for you to track students' progress and to organize peer conferencing. 4. Routine, Routine, Routine: Going into a choice board, students should already know where you keep their work. 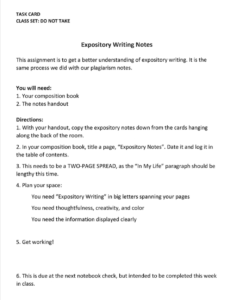 My students know it is in the crate in folders or on their LMS (learning management system). The choice card says where to find task cards. Having a format you follow when you write your task cards is also helpful. My headings are: Objective, Materials Needed, then Directions. 5. Provide the Estimated Time to Complete Assignments: This helps parents and students know at what pace their work should be done. 6. Try Everything: The first year I turned two units into choice boards. This second year I am revising my boards for skills and content and continuing to turn more units into choice board type units. I am trying playlists, where students have to either follow an order or they can "shuffle" and choose the order; I am also trying a menu-type board where there is choice in the appetizer, everyone does all of the main course assignments, and then they pick a dessert. Having a printed out calendar to schedule their assignments works for some students, but not all. Students feel like they have control — whether they want it or not! Challenges students to think (they are in charge of their learning and have to read and follow directions). Darcy: Will I eventually just do choice boards? No. Part of good teaching is knowing what approach to use and when to use it. I'm still in an exploratory phase, but I am finding balance and different practices to apply at different times. An observation I have made is that by integrating choice boards and removing me from the direct instruction position at the front of the room, students are way more attentive when I do get up in front of them. Overall, my classroom environment is a better fit for both my students and myself; I feel like I am no longer parroting Hamlet: To teach or not to teach — that's definitely NOT the question. My sentiments: I got this.